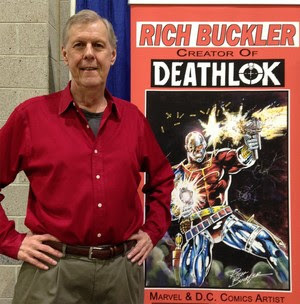 Legendary comic book artist Rich Buckler, co-creator of Deathlok, has agreed to become an ambassador for the Inkwell Awards. The Inkwells celebrate the artists that work as inkers in the comic book industry, often unappreciated for the contribution that they make to the comics medium. Legendary “Bronze-Age” comic-book artist Rich Buckler (Fantastic Four, Black Panther, Thor, creator of Deathlok, et al.) has agreed to support the artform of inking by joining the ranks of professional ambassadors for the Inkwell Awards inking advocacy. The Inkwell Awards is an official 501(c)(3) non-profit organization whose mission is to educate the public and promote the art form of comic-book inking, as well as annually recognize and award the best ink artists and their work. Now in its 8th year, the Inkwells are overseen by a committee of industry professionals and assisted by various professional ambassadors and numerous contributors. The organization sponsors the Dave Simons Inkwell Memorial Scholarship Fund for the Kubert School and hosts the Joe Sinnott Hall of Fame Award.